My children all love to play dress-up as most kids do. The boys like everything boy of course and what is more boy than a cool pirate costume? Costumes are not just for Halloween here, they are anytime costumes and we make use of them all year long. I love to encourage creative play and dressing up is a great way to do this. 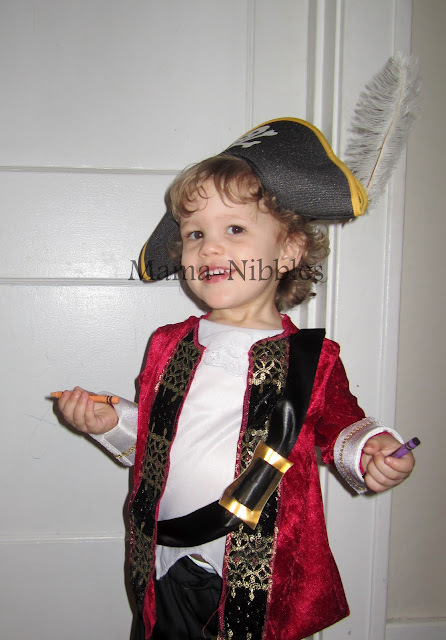 The costume I am going to tell you about is one of the cutest costumes for pirates you will find for your little baby pirate. I reviewed the El Capitan Toddler Costume with my little guy. The costume was made well and looked adorable on him. I ordered the toddler (Fits 3T-4T) size and my little guy wears a 2T. I would suggest for this particular costume to size up because the top would have been too snug if he had been a 3T or 4T. The sash with buckle did not drape as nicely in the photo on the Anytime Costume website but that's okay, it still looked alright. The boot covers are so adorable but my son would have nothing to do with them so we left those off after me trying to wrestle one onto his foot. The pants were nice and stretchy, they could easily go over another pair of pants if you did in fact use this for trick or treating in colder weather. The hat was way cute but it would not stay on no matter how hard we tried, it just popped up and off. If the hat had some kind of elastic band to go under the chin that would be better. There were a couple stray threads that needed trimming on the shirt. All in all I liked this costume, I loved the fast shipping and would definitely order from Anytime Costumes in the future. Enter to win $25 to spend at Anytime Costumes! US only Ends 6/19.